Last month, for the momentous 5th year in a row, Haselden Construction held our annual clay shoot benefiting Homes For Our Troops (HFOT). HFOT is an amazing organization that builds and donates specially adapted custom homes nationwide for severely injured Post-9/11 Veterans, to enable them to rebuild their lives. They are also in the top 4% of all charities evaluated by Charity Navigator! For the last several years, Haselden has been one of HFOT’s top three fundraisers in the nation, and this year will prove to be no exception. Our preliminary numbers show that this year’s shoot brought in about $100,000! There’s a lot of planning that goes into this one day every year! In fact, the planning pretty much begins the day after shoot. How do we make it so successful? The shoot is about more than just, well, shooting clay pigeons. It’s a chance for subcontractors, owners, architects, and yes, sometimes even competitors, to spend a day together outside, enjoying Colorado for a good cause. We couldn’t have asked for better weather this year! 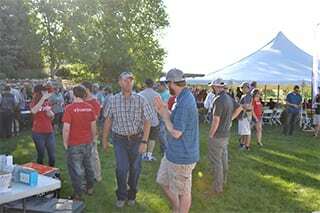 As with the last several years, we held the event at the Kiowa Creek Sporting Club. We started the morning with breakfast and handing out gear bags that included shells, hearing protection, eye protection, a raffle ticket, and a few other souvenirs of the day. This is also a time when people can walk around and take a look at all the cool things that are up for raffle! It was truly incredible to see the sheer number of people this year—272 shooters, 68 teams, and 88 volunteers—when we all came together for Byron Haselden’s introduction to the HFOT team and Veterans present, as well as the safety talk. With the number of teams we had, the shoot itself took about four hours, but time really does fly when you’re having fun! While everyone is out on the range, we have our Safety-Q team and volunteers back on the grill getting lunch ready. 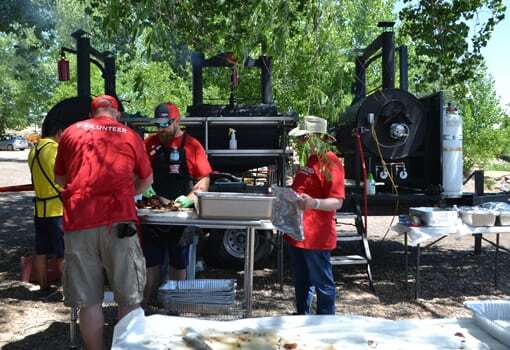 In fact, the preparation for the BBQ started several days before—feeding hundreds of people is no mean feat! And with BBQ chicken and ribs, potato salad, and baked beans, we were a well-fed crew. While everyone ate, we started raffling off those incredible prizes! Back to that Raffle . . . This is the coolest raffle ever with lots of things to change it up to keep it interesting. There is a standard general raffle where we pick tickets out of a bin for random prizes like Yeti coolers and a Ring doorbell and a Traeger grill. But there are also fun games for specific prizes (mostly nice firearms and even a gun safe! )—bingo-type games, card games, etc. At the end of the day, even those that didn’t win anything walked out with a spring in their step. It’s hard to beat a day of Colorado sunshine and a good cause. It would be impossible to pull off an event of this magnitude without the support of all of our major sponsors and every company that participated. This is truly a community effort!